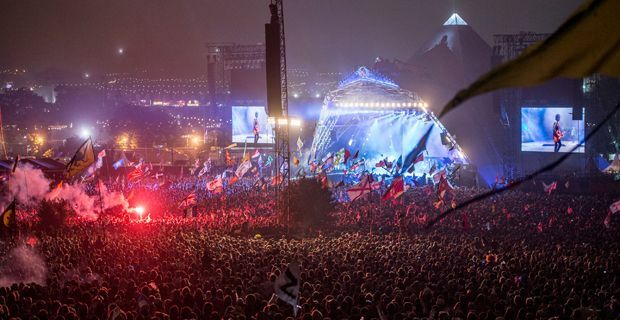 Last night, the Stones finally rolled through Glastonbury to headline the Pyramid Stage. The hype had been building. The crowd was heaving. The phoenix was rising. But were they any good? Well the (highly subjective) answer is that they weren’t half bad. Their musicality and superbly textured bluesy sound was on grand display. Jagger continued to defy the years with his uniquely twitchy take on rhythm and he owned the stage in style, but their set never really hit any high octane, sustained highs. There was a certain plod to some of the numbers like Midnight Rambler that dimmed the pace. Even Sympathy for the Devil lacked the electric charge that made the original so subliminally subversive. There just seemed to be a little intangible energy missing, but they rattled through many of the classics with an unmistakable verve. Opinion seemed sharply divided amongst the watching world, but ultimately, this was a good but perhaps not a great performance. Public Enemy meanwhile took the West Holts mantle up from Friday night’s sensational headliners, Chic. And they rocked it. Struggling to fill the gap left by a mysteriously absent Flavour Flav, Chuck D threw his all at the moment with a relentless flood of energy and with some wonderful improvisation they slammed out classics from Fight the Power to the crescendo of the more recent Harder Than You Think. It was a memorable moment and proved why Public Enemy are still searingly relevant after all these years. Primal Scream struggled to provide much interest, Chase and Status were a little bit too noisy dance pop, but lesser known acts like Everything Everything proved that there was still extraordinary innovation to be found in pop music with a blistering performance. More soulful, roots acts like Alabama Shakes and Josephine also soared to intoxicating heights with impassioned sets. With the late night areas in full swing until the dawn, this was another glorious day at the Glastonbury Festival.